I have no hope of not going for a walk in the morning. The dog is waiting at my door at 6.30 am- waits impatiently for my ablutions and whilst i don walking shoes, and then with great energy pulls me along the little roads of the village across the bigger main road past the village, she looks left and right ( am I imagining this but is the dog really that clever?) and hurtles up the track into the vineyards- then I let her off the leash and she races and runs like something possessed checking every once in a while to make sure I am still following.Today was especially fun , the rabbits seem to be home for the weekend as well- oh what fun to go hightailing through the vineyard chasing bunnies! 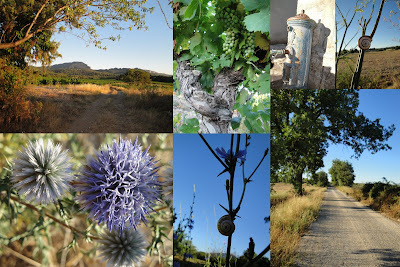 I enjoy the early morning light on Pic St Loup, watch the growing grapes, keep an eye on the almond tree and plum tree- not quite ripe yet but any day...marvel at snails attached to thin stalks,admire that weeds can make such interesting flowers, back along the country road past the water fountain with it's modern tap trapped within an older shell, and so home, 5 kms later. What a start to the day!! This is the complete quilt In the Spirit of Decoration. Unfortunately it was not selected in the competition for the Carrefour this year- wasted some money yet again, for the entry fee.. sigh... I can use it for my book on Syria as of course it was inspired by some silk I bought in Syria and the beaten decorated copper and silver plates you encounter everywhere . It is for sale. It measures 76 cm x 129 cm and is made from hand dyed and hand printed cloth from an original linocut- the silver discs have been hand embossed with patterns. It has been machine quilted. The price is 1,000 Euros. here is a detail image. Reader 300,000 is from Leipzig in Germany- if you know who you are please contact me ! 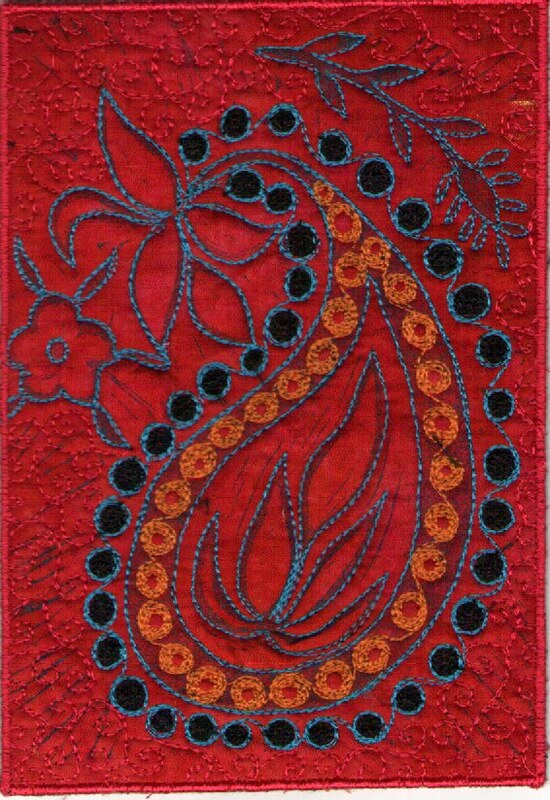 Later in August I am teaching in England before the Festival of Quilts event. The class I am teaching is called Breaking All the Rules. it is possible for students to make a couple of variations and simple colour contrast is used, but I realised that all my samples for this class are still in Australia. So I made this one as a sample- it measures 50 cm by 62 cm. This is about the extent of piecing i do, and it started out as an attempt to see how far you could make unmatched lines and still create a geometric effect.I also did some linocut printing in the border areas which created a nice contrast but also an opportunity for some stitching. 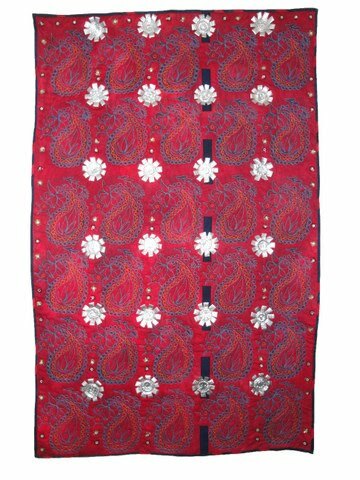 The dark cloth is actually a deep blue and the red colour just sings in this little piece. 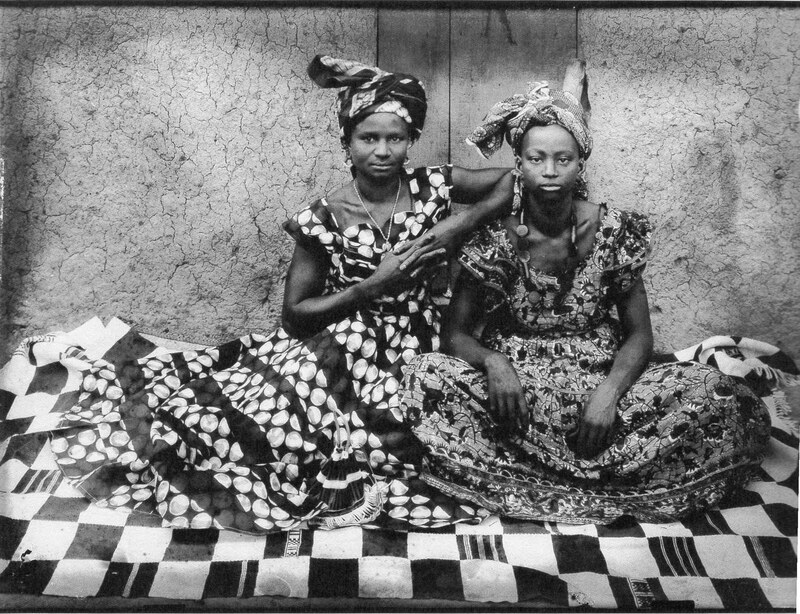 I always feel this kind of piecing has a very African feel so in that mood I want to share a photo portrait made By Seydou Keita a Senegalese photographer from the late 1950's whose portraits are just stunning, and of course i did notice that textiles are a very important part of his portrait compositions. Thank you for all the responses about freebie tutorials and youtubes. I will keep blogging as always- only 13 posts to go until I hit 1,000 posts since i started. 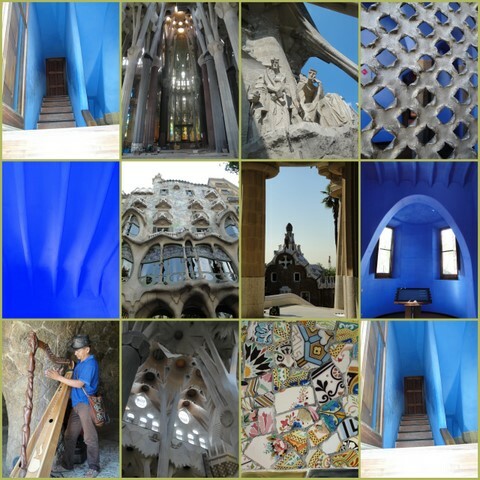 That is quite a lot of photos and work and words! Here is the finished Fairy Forest quilt. 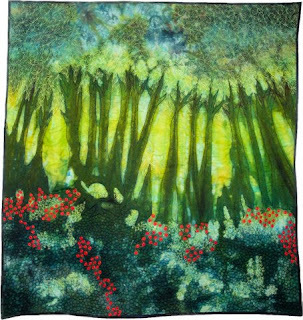 I have called it fairy Forest because of the kind of gnarly trunks of the trees.Initially i did not think the trees were so interesting as there seemed to be truncated trunks but now with all the stitching I like the effect.But this is definitely the last forest quilt I will do! It measures 94 cm by 89 cm. This piece is for sale for 800 Euros including postage. 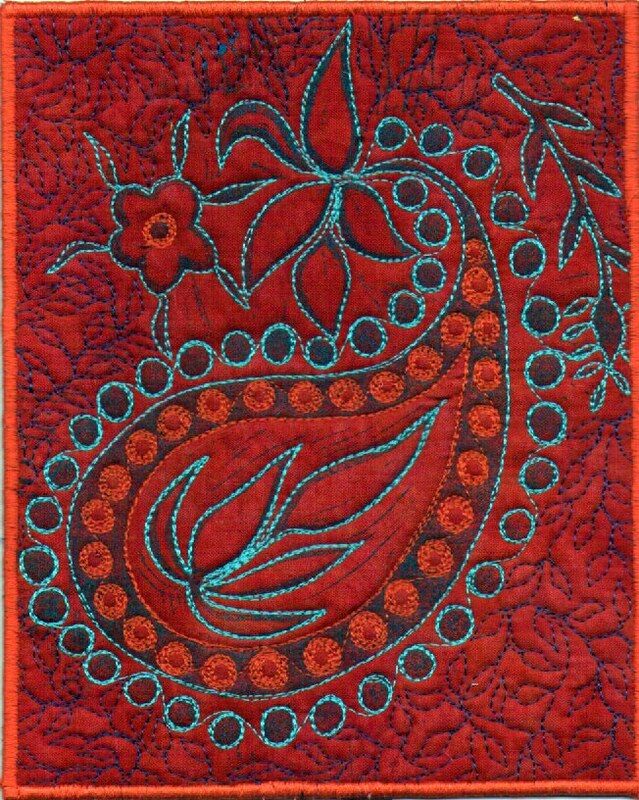 Email me if you are interested.It's been a very slow year for quilt sales I must admit- i don't think I have sold a big piece at all. Which makes it hard going to make a living .It is just as well I teach.I haven't made nearly enough small work for sale something which I intend to remedy over the next weeks before the Fete de Fil we are doing on 15 August at La Bastide-Rouairoux. And I really do wonder what impact all the free tutorials on blogs and youtube have- it seems that everything under the sun is a tutorial now and how will that impact on those who teach- is it a good thing or a bad thing or nothing at all?I am not sure .... I am thinking about this issue as I blog for the Bernina blog where i am making instructional posts. Absolutely the Last Forest Quilt! I am one of those people who finishes almost everything I ever start. I am not sure why, it's just one of those things. I can count the unfinished quilts i have made in 20 years of my quilting life on one hand. So the unfinished forest quilt that i found in my suitcase of quilts left in Paye Bas bothered me, despite the fact that i had said i would not make another forest quilt- the piece of cloth was too nice to discard in the corner of a cupboard somewhere. 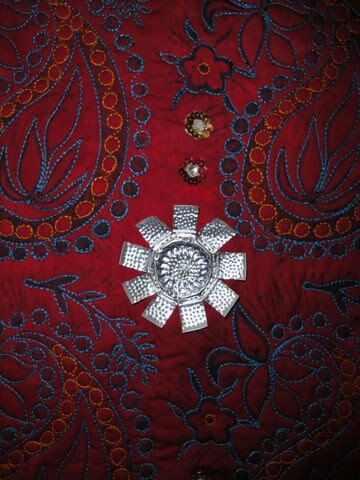 I actually pinned the cloth for a photograph shoot that Editions de Saxe did back in 2007 or 2008 for an article about my whole cloth forest quilts. I had done some small sections of stitching, so I have been working on finishing the stitching. 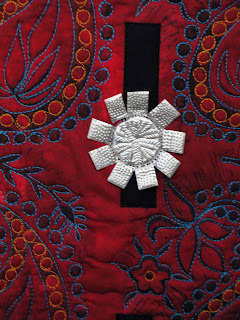 These pieces take ages as they are heavily stitched and I am blogging about the process of this quilt on the Bernina Blog. 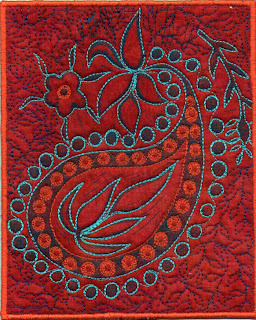 I also started out making the red circles orange, and after completing a section decided that the orange was too yellow- so rather than unpick all the stitching I had done I decided to stitch over the circles in red- the result of this overstitching is rather nice even if I do say so myself. It's been so hot- it's just hot and sunny here everyday. I get up early to take the dog for a walk- they say for humans you have to do something for 6 months before it becomes a habit- well i can tell you that for a dog it's nowhere near that time- in fact if I don't take the dog for an early morning walk, she pushes open the door in my room and then if I am not ready I am in serious danger of having my feet bitten off at the ankles. The up side of this is I am walking at least an hour every day through the vineyards- we usually take the same route as I love to see little shifts in what is flowering in the wild flower department, the growing grapes in the vineyard, shifts of light on Pic St Loup, which is starting to acquire a bit of a Mont St-Victoire sort of feeling inside my head though I am certain I cannot emulate Cezanne- the grand master. I am also thinking about a vineyard quilt- how to get the effect of those stunning shade of green and those gnarley branches. I am also becoming the queen of gazpacho- we have been trying out different versions and we take turns trying to out do each other ( my friend Liwanag is a great cook as well as wonderful quilter)- but the last gazpacho I made was very yummy- it is the best soup in hot weather! Oh and I tried to respond to the question a reader asked about the painted fabrics- it is a scratch back technique I am using. It is Bastille day here so I will start with something french first! The graveyard in Sete affords some wonderful views of the Mediterranean.The flowers in the foreground of the first image were made of ceramic- each grave seems to have a collection of them. The church bell is ringing seven, time to go for a walk with the dog otherwise I might be in danger of having no ankles left... but first a blogpost! 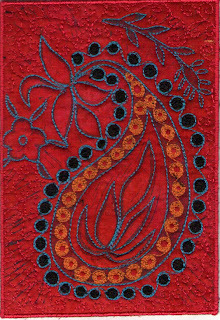 The above stitched paisley shapes are the lino-print I made recently, stitched. They are for sale at 25 Euros each inclusive of postage.. The first one measure 6x8 inches because i printed the shape on more of an angle and the second one measures 5 inches by 8. Had a lovely day yesterday at Sete a small city on the Mediterranean not far from here with a fellow antipodean and blogger Shirley Goodwin. The Paul Valery Museum in Sete is hosting an exhibition of Raoul Dufy ( unfortunately none of his woodcuts boohooo).it was a very good exhibition showcasing a good range of his works and really only confirmed something which I already knew- there is a lot of lessons to be learnt. 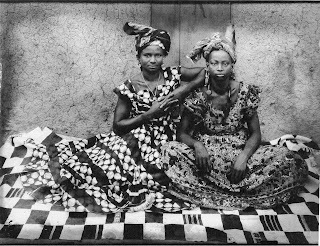 yes the early influences of the Fauves, Cezanne and Braque can clearly be seen , and yes I know he is considered to be "pretty' or lightweight compared to the great of Matisse and Picasso, but yet there is something that captures my imagination! There is still time to enrol in the on-line linocutting class- it will be the last one I do this year as looking at the logistics of this year - things get hectic and then I move back to Australia and have to find a house to live in and move all my stuff there and find a room to work in. This is a piece of silk I bought in Syria- I was told it was a very old design from the Ottoman period. It inspired this linocut- which is an in-progress photo. And i am coming to the United kingdom on August the 16th. I was going to be going to Birmingham and Festival of Quilts- but that has fallen through. If anyone is interested in my teaching a workshop in that week please let me know.or if anyone in the Netherlands/Belgium is interested in a workshop just email me. 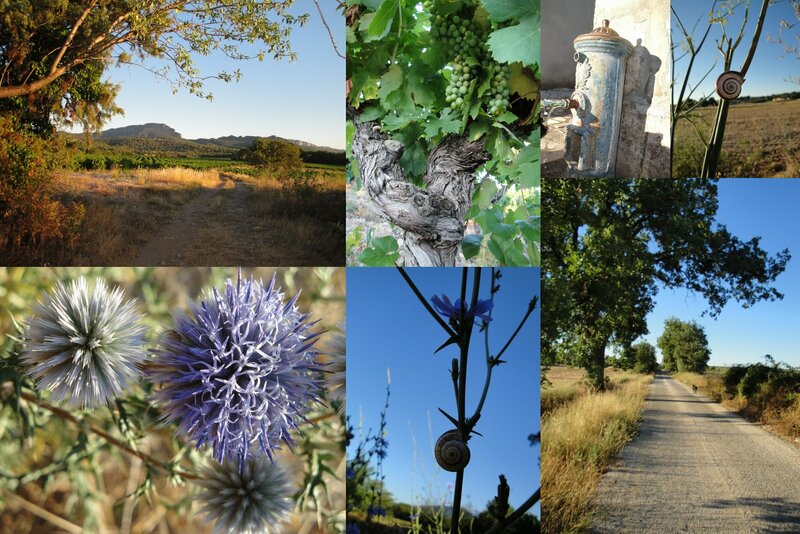 I love the olive trees in the Languedoc landscape and as the summer sun is sizzling all the grasses, and the wheat fields are ripening the landscape is turning into a myriad of subtle yellowish/terracotta colours. The grey of the olive leaves creating contrast and the gnarled old trunks of the trees whispering of other times- this is a land rich in history. I am thinking of making a big olive tree quilt and thought I would stitch this little one to trial some colours - and it is an imagined olive tree. I stitched with the Aurifil Lano thread onto khadi cloth . The piece measures 14 inches by 14 inches ( 35 cm square) and is for sale for 100 Euros inclusive of postage.
. I have had a number of requests via email as to when I am running my On-line Linocutting course again. So now is the time! I will start it on the 14th of July- because I am in France! The cost is 40 Euros or $54 US. The course extends over 6 weeks with fortnightly instalments of the lessons delivered in pdf format. I set up a group to share your experiences and to trouble shoot any problems you may encounter. The lessons progress from mark making with the tools to more complex image cutting, using your photos as inspiration, and colour printing.I can be paid via Paypal- just email me for details.